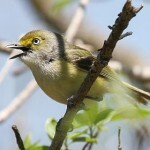 Song is hoarser than Blue-headed Vireo’s; sounds more like Yellow-throated Vireo’s. Description: Sexes similar. Lacks blue-gray head. Olive head and back; bold white spectacles; two whitish wing bars; white underparts and throat with yellow sides. 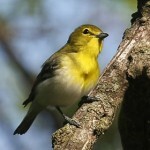 Habitat: Usually found in mixed woods, especially pine-oak forests. Feeds from canopy to shrubby understory. Where in Nebraska: Accidental. Normally a west coast species. 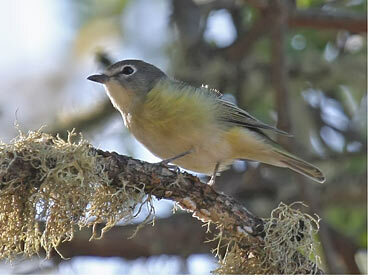 Fun Facts: Cassin’s Vireos will fiercly protect their nests by diving at and driving away nest predators. 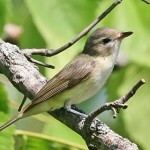 Additional Information: Once lumped with Blue-headed and Plumbeous Vireos into one species, the Solitary Vireo.